Terra Istriana is situated on the building, recreational and agricultural area of abt.110.00 ha. 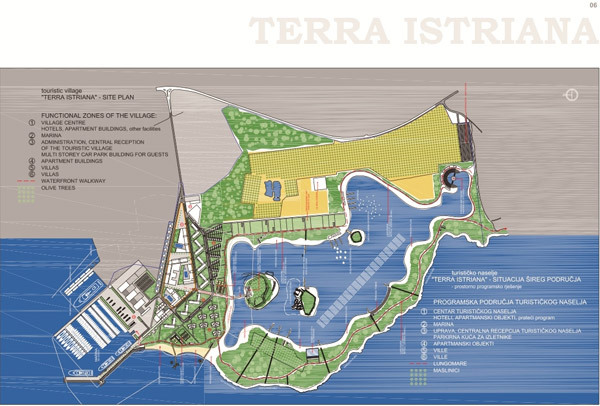 The majority of assets of Terra Istriana Umag Ltd (hereinafter: Company) consists of property owned by an building area of approx. 15 ha, along with concession rights on the surface of the sea on the surrounding land in the area of the Kravlji rt in Umag and concession rights in the area of Stancija Grande in the area of Savudrija (nearby place next to Umag). The Company has no employment contracts for an indefinite period and is not burdened by any credit commitments, or real estate property encumbered by mortgages or other encumbrances. On the real estate owned by the Company, in accordance with applicable land use plans (which are adopted by the level urban development plan) it is possible to build tourist facilities among other purposes (T2) with a total capacity of 2.270 beds and a marina with 199 berths (LN) and mixed residential and commercial facilities (M1-4). Given the size and importance of the project for the realization of the project it is possible to use the benefits provided by the law on strategic investments. At this point in the area of coverage of the Urban Development Plan Terra Istriana or within approx. 110 ha which are the subject area of the project Terra Istriana the former exploitation field was remediated, 90% of all buildings and landscaped for future construction were removed, the artificial lake area of over 23 ha was redacted, with an average depth of 4.0 meters, stocked with saltwater fish -bass, and a smaller lake of approximately 2 hectares derived from sources of drinking water stocked with freshwater fish – carp. The reforestation of the area was carried out with over 6000 different plants, of which over 5000 olive seedlings that are used for the production of the famous extra virgin olive oil Terra Istriana. Also an animal nature park was created which is enriched with diverse animal fauna such as deer, mouflons, donkeys, sheep, goats and poultry variety. Sellers will submit upon request for review the current conceptual designs, which may give the bidder a visual insight into the possibilities of building diversity. This is the integrated 3rd generation tourist project of complete and sophisticated experience with a wide range of activities specifically associated with a feeling of comfort, relaxation and cultural activities. The main features by which this complex will be different from others is the lake, as well as its unique characteristics, and agriculture as an integral part of the complex. It will consist of the Adriatic inspired architecture and a strong connection with the lake and sandy beaches, olive groves, arboretums. The Company, as the owner of lands and other vested rights, seeks partners in order to be offered to the market, to interested international hotel companies, investors or investment funds implement the project.